RALEIGH, N.C. (AP) — It was a day like any other day — except that it was the seventh anniversary of the U.S. invasion of Iraq. And, for the most part, that was forgotten. "Honestly, with everything that's going on in my personal life, it slipped my mind," said Chris Skidmore, 39, as he sipped a drink on the artificial lawn at Raleigh's North Hills Mall. "I've been out of work since August of last year." It's not that the average American isn't aware that we still have tens of thousands or troops in Iraq, or that nearly 4,400 U.S. military personnel have died there since the war began. 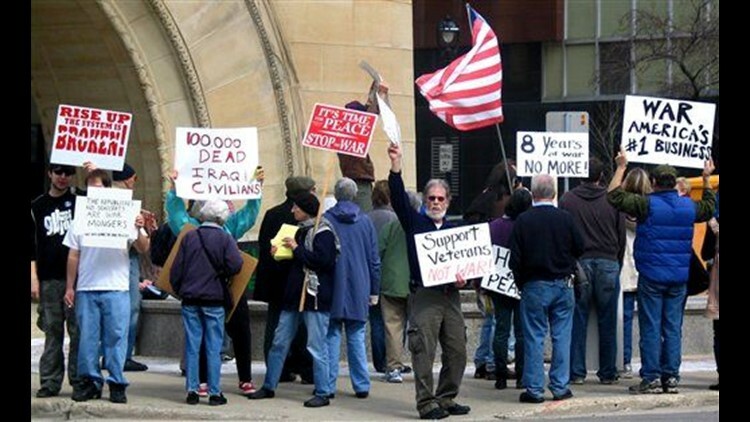 Scattered demonstrations were scheduled around the country to call for the troops' swift return. But with so much else going on — a torpid economy, a climactic debate over health care reform, a mounting conflict in Afghanistan — it's easy to lose sight of the fact that Americans are still fighting and dying in Iraq. Somewhat sheepishly, Princeton University historian Sean Wilentz acknowledged that the date's significance was lost on him. But he said he and other Americans can be forgiven for not having March 19 marked on their mental calendars. "Unlike Sept. 11 or unlike Dec. 7, 1941, it was not a war that began with a traumatic event," said Wilentz. "There was a long buildup to it. There was a lot of debating back and forth. ... There wasn't quite the sense of drama, shall we say, of the event itself, even though there were lots of dramatic events that happened that night. "But the date did not burn itself into one's memory the way the others did." Master Sgt. Normand Roy of Lewiston led a Maine National Guard platoon in Iraq, and three soldiers in his battalion were killed there. He figures he fought for his fellow Americans' freedom to forget about the war. "That's what's so great about America," he said. "People have a right to their opinions. ... Unless it's right there in front of you in plain sight, then you tend to forget." Even in places like Oceanside, Calif., whose barber shops and dry cleaners cater to the Marines at nearby Camp Pendleton, the anniversary went largely unnoticed — as it has in years past. About a dozen people interviewed Friday said they were unaware of the milestone. Troops and their families are much more focused on Afghanistan, where thousands of troops from the I Marine Expeditionary Force are headed. Iraq still stirs strong feelings on about whether the war was justified, but folks say it has faded to the back of their minds. Iraq has become a resort compared with Afghanistan today, said Christina Schrom, 26, who works at Jeanette's Dry Cleaning. "Afghanistan is more like Iraq was in the beginning." The White House made no comment Friday on the anniversary of the start of the war. The U.S. military said there were no ceremonies or special events to mark the day, which saw five Iraqis — but no Americans — die in violent incidents. The day did not go unmarked everywhere. In Milwaukee, a small but vocal group of protesters marched through downtown carrying signs that read "Bailout for education, not for corporations," and "Health care not warfare." The protest, organized by the Milwaukee Coalition for a Just Peace, drew about 75 people Friday, down from 200 last year and 500 the previous year. "It's a little frustrating when people seem apathetic, but I don't blame the individuals," said Jacob Flom, 24, a junior at the University of Wisconsin-Milwaukee and an Air Force veteran who didn't serve in the current wars. "It's because the corporate media doesn't raise the issue anymore." Sunning himself on a bench outside the Veterans Affairs Medical Center in Philadelphia, Vietnam veteran Marcus Patterson said he doesn't think people have forgotten about the war; they're simply overwhelmed by everything else. "You've got the economy, you've got the stock market going down the drain, people losing their jobs, people losing their homes," said Patterson, 65, a retired mason, as he leaned on his cane. "You've got worries that are right in your face, close to home." "It's our daily reality now, so we don't think of it as much," agreed fellow Vietnam vet Turk Wallis, 67, who was waiting for a friend outside the hospital on a motorized scooter. "Everybody's tired, overloaded. I don't think there's any disrespect, but you're going to tune out certain things after a while." But forgetting is a luxury military families cannot afford. Virginia Hagin's husband, 1st Sgt. Randy Hagin, is a drummer in the 1st Infantry Division Band. His mission in Basra is to boost the morale of soldiers and civilians, but he took a few minutes Friday morning to raise the spirits of the couple's two sons — Joseph, 4 and James, 5. When he called home to Fort Riley, Kan., the boys asked him to sing "Boris the Spider" by The Who. A lot of folks who have spouses in Iraq "don't watch the news, but I do," Virginia Hagin said. "I notice that they are talking about Afghanistan and the new surge. During the (Iraq) elections, that was still in the forefront. "I really do feel like it's a good thing. I would much rather hear good things." Back at the mall in Raleigh, Lauren Lewis admitted that she only thinks about Iraq "once every couple of weeks." Picnicking on the fake grass with her 18-month-old daughter, Liza, Lewis said it doesn't really matter to her when the war began. "Maybe the end of the war would be the date that would be burned in our minds more," she said, as Liza buried her head in her mother's lap. "Then it's over." AP writers David Sharp in Portland, Elliot Spagat in Oceanside, John Milburn at Fort Riley, JoAnn Loviglio in Philadelphia and Dinesh Ramde in Milwaukee also contributed to this report.